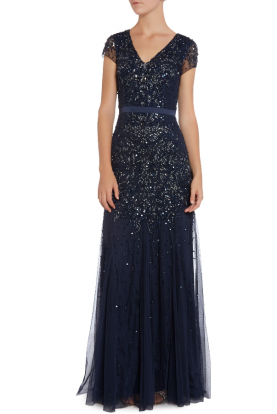 You will look and feel like a starlet while wearing this Jovani piece that features all over sequins, sheer material at the front upper bodice that ties together at the back with a button, a complete open back that runs all the way to the waist and from there the sequins start once again. The sleeves appear to have a capped design and they are really short. Lastly the dress has padded cups and there is a back hidden zip. Be seen in this stunning mini dress that is perfect for Las Vegas! !